Retired SketchUp Blog: Google Earth, SketchUp, and Honey did! Google Earth, SketchUp, and Honey did! Recently, my wife and I realized that the plywood retaining wall keeping our backyard from sliding into the pasture behind our house had to go. She kept reminding me that I work with Google modeling tools everyday and should come up with a plan to build a replacement wall. Honeydew (read "honey, do") turns out to be more than a melon. But she was right. Using Google Earth, I was able to get a very accurate view of the construction area and with Google SketchUp, I created a model that guided the design and construction by our contractors. The challenge was to replace the plywood with something that would last a long time and give us access to the pasture. Time, water and gravity take their toll for, sure, as you can see from the "before" picture. 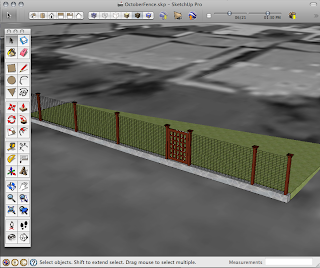 An overhead view in Google Earth provided an accurate measurement of the total fence width. But I had some concerns about the actual property line because the pasture is privately owned. A very cool thing you can do with Google Earth (works great in free version or Pro) is to import electronic parcel data. Many cities and county governments provide their survey and parcel data online as a public service. Google Earth makes it easy to use. My city had my house's parcel data - which I found and loaded. I brought the Google Earth view into SketchUp and did some initial design to get scale and sense for what was possible in the actual space. Of course, my design comps had to go through review and approval with the boss (I'll leave you to guess who that might be). Then, we worked together using SketchUp to plan the look of the fence. We wanted a nice gate to give us access to the pasture. There are some beautiful custom fences available online, but they would have cost half our budget! So instead, we "drew inspiration", a nice way of putting it, from some Google image-search results. With the model in context, we were easily able to communicate with the contractors who bid the job. The only question they had was about the gate, since they had to have their carpenter create it. No problem, as I had constructed the gate in SketchUp to scale by simply array-copying the 2x2's and 2x5's. 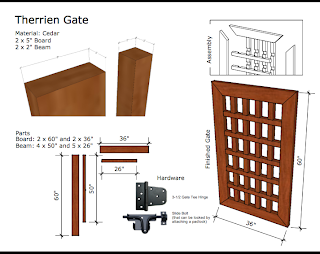 But, because I have the Pro version of SketchUp with LayOut, I was able to provide the carpenter with a PDF that had not only the dimensioned gate, but images of the hardware we wanted to use an an outline view of the assembly. No muss no fuss. The resulting gate was cool to see! The contractors were great and got the job done under budget and on schedule. I may have even created some SketchUp converts. Final results are below. Excellent job! and great finished product!! Wow. How did you do the gif Images? What did you use to put together the images for the post? Did you do them in Sketchup with Photo-match or something else? I'm just as digital as the next guy, or maybe a little more, but I hope you got an actual property survey before you built the fence. Between the probable errors in the original parcel data, the errors in image position, and the fact that property lines are typically controlled by monuments instead of measurements, determining a fence line off Google Earth is an intensely bad idea. Really it is nice post and thanks for sharing it and really it is very useful. Please come visit my site Arlington Web Link when you got time. I am not really sure if best practices have emerged around things like that, but I am sure that your great job is clearly identifed. I was wondering if you offer any subscription to your RSS feeds as I would be very interested and can't find any link to subscribe here Please come visit my site Corpus Christi Business Directory Forum Blog Classifieds when you got time. Thanks. As stated above, the property line location isn't likely to be very accurate using google and GIS data.......It sounds to me like you have taken a big risk here. To echo what Chris said above....please, please get a survey before doing anything near a property line. The County parcel maps are for information only and are not to be used as accurate boundary line data. Only a surveyor can verify a property line to the extent of comfort you would want to construct an expensive fence. You say, "But I had some concerns about the actual property line because the pasture is privately owned. ... My city had my house's parcel data - which I found and loaded." I would be very cautious importing any parcel data that a city or county uses in their GIS systems. While the data may look very precise, there is almost no chance that the accuracy is sufficient enough to make true property line determinations. Especially when overlaid upon aerial photography of unknown origin that has probably been re-scaled or otherwise manipulated for presentation. Property lines are generally based upon monuments actually present on the ground and/or possibly the actions of the adjoining owners. GIS coordinates rank extremely low when it comes to evidence used in boundary determinations. Technology is a great thing when used properly. However, when it comes to property boundaries, I would trust the knowledge and experience of a professional land surveyor over that of the county GIS any day.